The discoveries of two new huge plant-eating dinosaurs were announced this week, according to reports in PLoS ONE and the Journal of Vertebrate Paleontology. Both boost the number of known dinosaurs from Latin countries. The first is Zby atlanticus, which lived 150 million years ago during the Upper Jurassic of what is now Portugal. Its remains were excavated in the town of Paimogo, north of Lourinhã, near a site where dinosaur eggs were also found. This dinosaur grew to over 62 feet long. It also had wider teeth than most other sauropods. The size makes sense when you consider that Portugal was also home to some of the biggest meat-eating dinosaurs that ever existed. Girth and height must have given herbivorous Zby atlanticus a fighting chance against predators like Torvosaurus gurneyi, the largest carnivorous dino ever to stomp around what’s now Europe. Rock star paleontologist Octavio Mateus from the New University of Lisbon helped to discover both of the Portuguese dinosaurs. The new dino’s unique name, Zby atlanticus, comes from paleontologist Georges Zbyszewski, who hunted for dino remains for many years in Portugal. “Zby” honors him. The “atlanticus” part is due to the present locality of Paimogo, which has a scenic view of the Atlantic Ocean. Video: Could a Fossilized Mosquito Resurrect Dinosaurs? “We thought for a long time that it was a species that was known in Spain, the turiasaurus, but in fact the anatomical differences we began to notice were sufficient for us to reclassify it, not just as a new species but as a new genus for science”, Mateus told The Portugal News Online. He explained that “various different crests on the bones of its limbs” helped to distinguish Zby atlanticus from other previously documented dinos. The second new big dinosaur, now added to the record books, is Leinkupal laticauda. It was found in what’s now Argentina and has at least a couple of claims to fame. It’s believed to be the first diplodocid from South America, according to Pablo Gallina and colleagues from the Universidad Maimónides and Museo E. Bachmann in Argentina. Diplodocids are part of a group of sauropod dinosaurs known for their large bodies, as well as extremely long necks and tails. The size of L. laticauda hasn’t been confirmed yet, but as a diplodocid, it has to be huge. The other claim to fame is that L. laticauda was the most recent known diplodocid. It lived during the Early Cretaceous period. 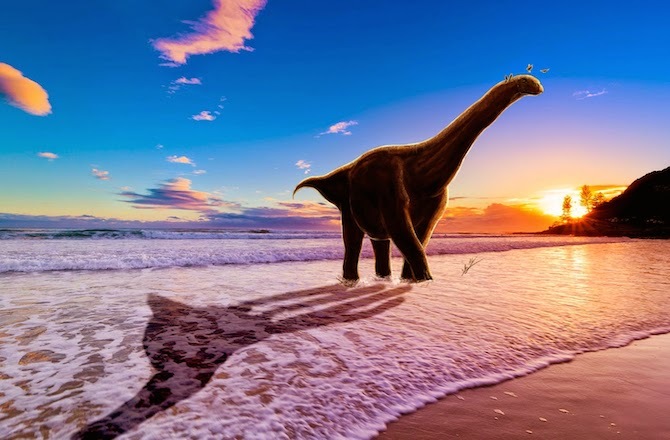 Previously it was thought that this group of dinosaurs, which lived throughout the world from the Americas to Africa, died out at the end of the Jurassic. Now we know that wasn’t the case. Perhaps just a single population, represented by Leinkupal laticauda, lived on at least through part of the Early Cretaceous.